83% of women survive cervical cancer for at least one year, and this is predicted to fall to 67% surviving for five years or more, as shown by age-standardised net survival for patients diagnosed with cervical cancer during 2010-2011 in England and Wales. 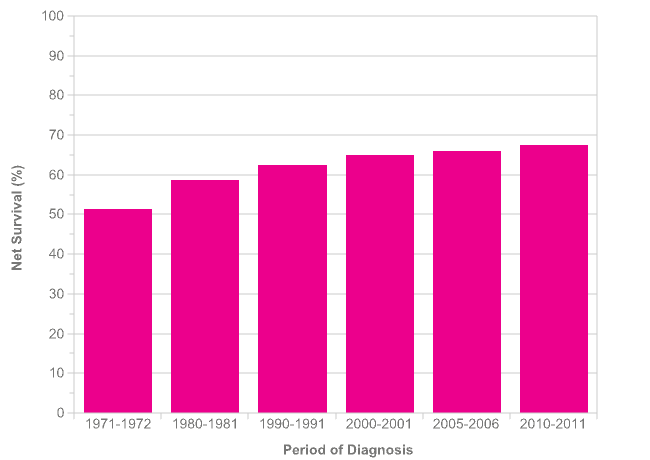 Cervical cancer survival gradually continues to fall beyond five years after diagnosis. 63% of women are predicted to survive their disease for ten years or more, as shown by age-standardised net survival for patients diagnosed with cervical cancer during 2010-2011 in England and Wales. Out of 20 common cancers in England and Wales, ten-year survival for cervical cancer ranks 8th highest overall (and 6th highest for females only). These high survival rates can be attributed in large part to cervical screening. Screening can detect cervical cancers at an early stage when treatment is most likely to be successful. Survival for cervical cancer is reported in Scotland and Northern Ireland,[2,3] though it is difficult to make survival comparisons between countries due to different methodologies and criteria for including patients in analyses. 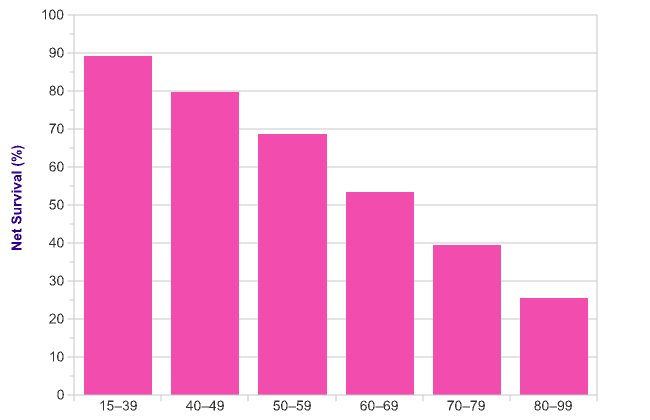 Five-year survival for cervical cancer is highest in the youngest women and decreases with increasing age. Five-year net survival ranges from 89% in 15-39 year-olds to 26% in 80-99 year-olds for patients diagnosed with cervical cancer in England during 2009-2013. 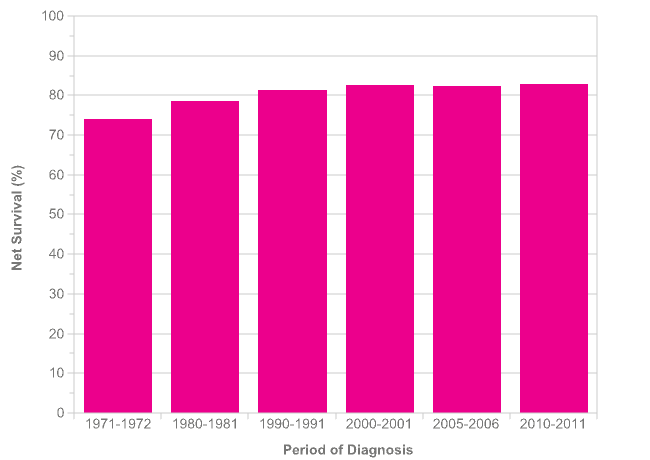 As with most cancers, survival for cervical cancer is improving. One-year age-standardised net survival has increased from 74% during 1971-1972 to 83% during 2010-2011 in England and Wales – an absolute survival difference of 9 percentage points. Five- and ten-year survival has increased by an even greater amount than one-year survival since the early 1970s. Five-year age-standardised net survival for cervical cancer has increased from 52% during 1971-1972 to a predicted survival of 67% during 2010-2011 in England and Wales – an absolute survival difference of 16 percentage points. Ten-year age-standardised net survival for cervical cancer has increased from 46% during 1971-1972 to a predicted survival of 63% during 2010-2011 in England and Wales – an absolute survival difference of 17 percentage points. Overall, more than 6 in 10 women diagnosed with cervical cancer today are predicted to survive their disease for at least ten years. Survival for cervical cancer is related to stage of the disease at diagnosis. 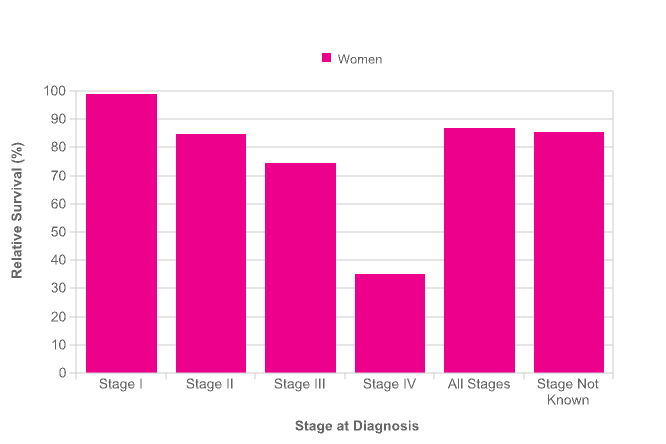 The majority of patients are diagnosed at Stages I or II. 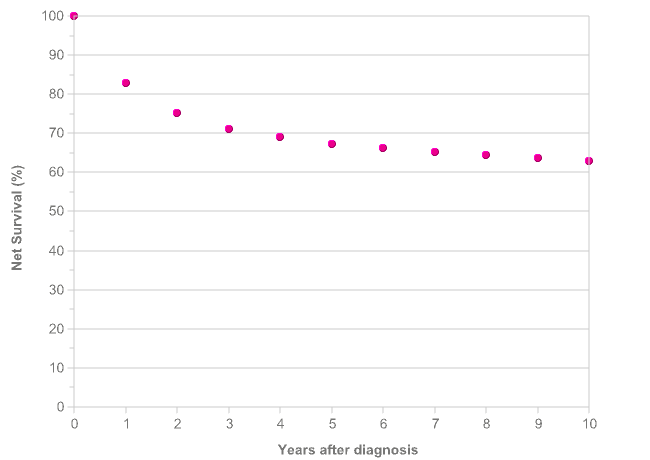 One-year relative survival for cervical cancer is highest for patients presenting at Stage I, with 99% of patients surviving their disease for at least one year for patients diagnosed during 2006-2010 in the former Anglia Cancer Network. One-year survival is lowest for those diagnosed with Stage IV disease (35%). As very few patients are diagnosed at Stage III or IV, the one-year survival statistics have wide confidence limits and should therefore be interpreted with caution. Relative survival can be greater than 100% because it accounts for background mortality and means that people diagnosed have a better chance of surviving after diagnosis than the general population. Five-year survival for cervical cancer shows a much more rapid decrease in survival between Stages I and IV. 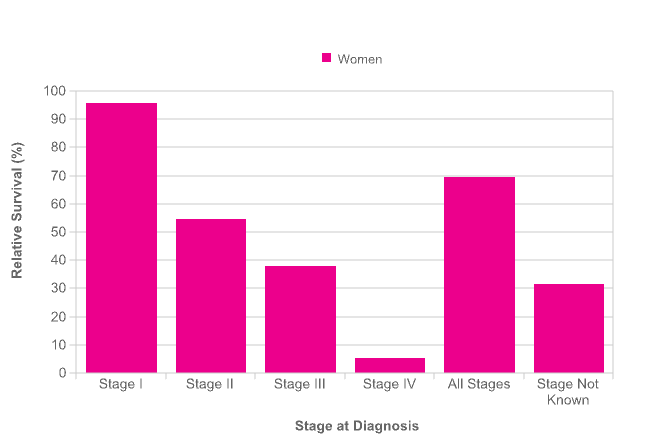 Five-year relative survival ranges from 96% at Stage I to 5% at Stage IV for patients diagnosed during 2002-2006 in the former Anglia Cancer Network. In this section, survival by stage is provided for the former Anglia Cancer Network in the east of England. Five-year relative survival for cervical cancer in women in England (60%) is below the average for Europe (62%). Wales (58%) and Scotland (58%) are also below the European average but Northern Ireland (61%) is similar the European average. 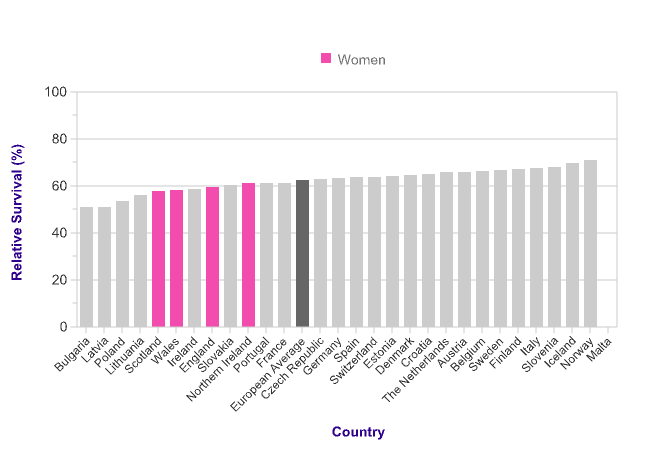 Across the European countries for which data is available, five-year relative survival in women ranges from 51% (Bulgaria) to 71% (Norway). 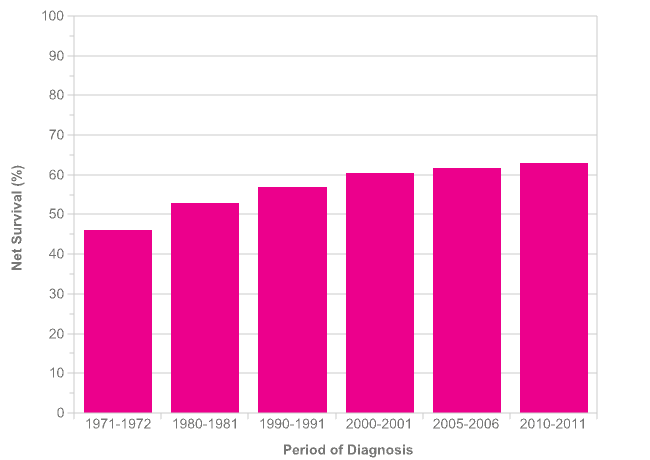 Data is for: 29 European countries, patients diagnosed in 2000-2007 and followed up to 2008, cervical cancer (International Classification of Diseases for Oncology [ICD-O-3] C53).